Oman Aviation Group said it has signed an agreement with the World Ocean Council to share the know-how, expertise and opportunities affecting corporate ocean economic platforms. 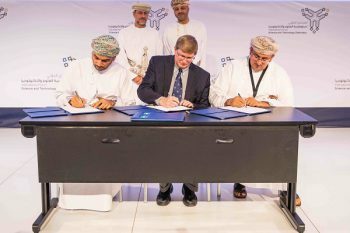 The MoU was signed during the closing ceremony of the Ocean Economy and Future Technology Conference, a three-day conference that brought together international speakers, delegates and panelists at the Oman Convention and Exhibition Centre. As the country’s aviation sector developer, Oman Aviation Group enables growth and development across the sultanate by linking various economic sectors. With fisheries, sea-to-air cargo, and cruise tourism playing a key role in advancing Oman’s economy, the group recognizes the importance for responsible ocean management and stewardship. The World Ocean Council, for its part, brings a depth of ocean industry expertise along with a commitment to promote and ensure sustainable development for a healthy and productive global ocean. It is the only international, cross-sectoral alliance for private sector leadership and collaboration in ocean sustainability, stewardship and science. Companies from a range of industries worldwide are distinguishing themselves as leaders in “Corporate Ocean Responsibility”, including: shipping, oil and gas, tourism, fisheries, aquaculture, mining, renewable energy, ocean technology and investment, he added.